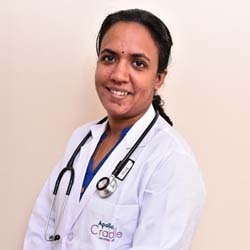 She completed her MBBS from Andhra Medical College, Visakhapatnam in 2004, MS – Obstetrics & Gynaecology from Andhra Medical College, Visakhapatnam in 2008 and DNB – Obstetrics & Gynecology from DNB board, New Delhi in 2009. She has more than 9 years of experience in Obstetrics & Gynecology practices. Languages Spoken: English, Hindi, Telugu and Kannada. I was under the observation of Dr. Sandhya Rani who had given me the best care. She was very compassionate and caring. I recovered sooner and to the full extent. All the credit for Apollo Cradle team. Mrs.Dhivya MS – Brookefield, Bangalore. Apollo Cradle was an excellent choice for me. I was under the care of Dr Sandhya Rani and I am satisfied with my choice. The doctor and her team are extremely efficient and experts. The nurses are trained and highly skilled. I just wanted to let you know the amazing staff you have should be commended. Good job, Apollo. Mrs.Lalitha. I – Brookefield, Bangalore. The services at Apollo Cradle are great. The team is quick, polite, and well behaved. They have highly personalised service and pay attention to detail. I was under the care of Dr Sandhya and I had a very comfortable time here. My needs were paid attention to and Dr Sandhya communicated openly and explicitly about all procedures. Great service by Apollo. Mrs.Hima Bindu – Brookefield, Bangalore. Our experience at Apollo Cradle was pleasant. I was under the care of Dr Sandhya. The services were tailored to suit us. It was convenient, flexible to our comfort and there was no problem at any step of the way. The services were of utmost superior quality. There is a sense of “personal”, warmth, care and consistent support here. Mrs.Rakhi Biyani – Brookefield, Bangalore. I had a once-in-a-lifetime experience at Apollo Cradle. The team was highly accommodating and agile. Dr Sandhya is committed, skilled, and highly educated in her field. Your level of care and service is the standout for excellence! Thank you, Apollo Cradle. I received such wonderful care and support at Apollo Cradle. I was admitted to Apollo Cradle under the care of Dr Sandhya. The staff was supportive and kind. They were helpful, considerate, and accommodating. Dr Sandhya is excellent in her field and very friendly. Definitely a pleasant experience. Thanks, Apollo. Mrs.Akshata Kulkarni – Brookefield, Bangalore. I am very happy with the serviced provided to me by Apollo Cradle. I was under the care of Dr Sandhya Rani, who was really helpful all the time. Everything was orderly and on time. The staff was polite and well-behaved. Dr Sandhya and her team went beyond the extra mile to make my experience the best it could have been. Thank you, Apollo Cradle. The staff of Apollo Cradle is caring and kind. Dr Sandhya was extremely nice and breathed confidence in me. We were properly explained the procedure by the PRO before admission. There was barely any waiting time and the staff was extremely well-behaved and agile. I was referred to Dr Sandhya by my family. My experience with her has been amazing. She is an excellent doctor and highly qualified. She is helpful, understanding, and accommodating. There were no procedural delays and I was thoroughly attended to. All in all, a comfortable experience with Apollo Cradle. During my treatment in the Apollo Cradle, Whitefield, I had an amazing experience. The staff is amazing and compassionate. During admission, the front office helped with all the queries. Dr Sandhya Rani and her team was very supportive and understanding. Rita personally paid special attention to our needs. The food was healthy and came on time. The housekeeping staff was regular and nicely maintained the room. I will certainly refer my friends. I am very impressed by the services provided at the Apollo Cradle, Whitefield. I was admitted for observation and stayed in the deluxe single room. The main factor is the amount of care they take while treating you. Right from the front office, nursing staff, Dr. Sandhya Rani, housekeeping and kitchen staff, all are so cooperative. Patients’ comfort is their first priority. The discharge and billing process was also smooth. They absolutely met my expectations. I was admitted to Apollo Cradle, Whitefield for observation under the care of Dr Sandhya Rani. The overall experience was good. However, the PRO didn’t have enough knowledge and package explanation was also not clear. The front office team was cooperative. The doctors were understanding and responsive. The nurses were also empathetic and easy to communicate. The food and housekeeping services were very good. I will surely refer Apollo Cradle to all my relatives. I had a wonderful experience with Apollo Cradle. The support provided by all the doctors and nurses was extremely good, and I’m very happy we chose this hospital for my delivery. Thank you Dr. Sandhya Rani and everyone on the nursing team. Best wishes to you all. Best nursing service, I\’ve experienced, as they\’re prompt and caring. I\’d like to particularly mention Sr Ponsegalini and Sr Vijayashanthi, for being so supportive. Our doctor, Sandhya Rani was an excellent support and her correct guidance made a lot of difference. Thank you everyone at Apollo Cradle. Had a good stay in Apollo Cradle. The service provided by the staff and doctors were excellent. Sr Vijayashanthi and Ms Sayantini were very helpful. Dr. Sandhya Rani was a great doctor and we were happy to have her expertise to guide us all along. I\’d like to thank the entire team at Apollo Cradle, doctors, nurses, front desk, housekeeping, for giving me and the other patients such good service. Everyone took very good care of the mother and baby, and my doctor, Garima Jain was excellent. Thank you! I am very happy to have delivered my baby here. Everyone is very caring and friendly. There are no words to explain how comfortable I felt here, in an environment that is so well maintained and homely. Thank you Apollo Cradle. Our doctor was Dr. Sandhya Rani and we were very happy with the way she walked us through our pregnancy. Special mention to the sisters, and even housekeeping for their care and help. Thank you! Dr Sandhya and Dr Bhawani are excellent doctors and true professionals. Apollo Cradle provides excellent service, and the doctors are absolutely great. Everyone is easily accessible, the procedures are well planned and structured. It is a complete package indeed, and I recommend it to my friends and family. Dr. Sandhya support me very well, staff is helping. I am happy with cradle facilities. Dr Sandhya and Dr Bhawani are excellent doctors and true professionals.Excellent service and doctors,easy access,well planned and structured.It is a complete package. Very good experience at Apollo Cradle, Brookfield; My gynaecologist is Dr. Sandhya who has been very supportive. I feel that I am in the right place with the right team. I will definitely recommend Cradle Brookfield to all my friends Thanks to Dr. Sandhya and team for the support. Thank you so much to Ms. Priya Srinivas and Ms. Divya for the wonderful baby shower programme at it was very well organised at Cradle Kormanagala Special thanks to expert for the wonderful session. Consulting Dr. Sandhya at Cradle – Marthahalli, team and doctors are very approachable. I was really impressed with new Cradle centre at Brookfield, Consultting Dr. Sandhya Everything feels wonderfully reassuring. Consulting Dr. Sandhya at Apollo Cradle at Brookfield along with attending Yoga classes. It was a very good experience at Apollo Cradle, Brookfield. The doctors Dr. Sandhya Rani and staffs were very helpful. Very satisfied with the professionalism and personal care provided by the concerned authorities. Attended the baby shower, had a great time. Thanks to Priya, Divya and Dr Sandhya .Enjoyed the event and hampers gifts – thanks a lot for making our day very special. Looking forward to delivering at Cradle very soon. Delivered my baby at Cradle Kundahalli with Dr. Sandhya Very Happy for services provided &amp Care given. Based on our experience, we recommended Apollo Cradle to our friends. Good experience. Dr. Sandhya and Cradle team, please keep up excellent work. Patient care officer: Literally available 24 hrs. The smile on her face never fades away even as she remains up on her feet at all times. There are so many people we would like to give special thanks to but in the interest of time I can only mention their names – Kalavati Akka, Getsy, Dr. Ruth, Sandhya, Nurse Punnu, Nurse Lydia and the list goes on and on. Very satisfied with the professionalism &amp personal care provided by Cradle Team at Brooke fields including my doctor. My gynaecologist Special Thank you the doctor. The doctors and nursing services are really good and deserve appreciation. I am so much happy with the services at Cradle Brooke fields am consulting. Overall our stay in Apollo Cradle, Marathahalli was nice and satisfactory. The services provided and staff cooperation was extremely good. Overall happy with services at Apollo Cradle; Special thanks to Dr. Sandhya Rani. Nurses Vijaya Shanthi is proactive and her team Kudos to the team. Special thanks to the cleaner & workers, they are really working hard and co-operative. Extremely good experience with Dr. Sandhya Rani – Cradle Brookfield hospital. Was took care support given even at the night hour. Very Happy with over all services Apollo Cradle Brookfield, thanks to my Dr.